For more than 35 years now, we have been monitoring loads and stresses in nuclear power plants. We contribute to optimisation and increase safety and reliability with our proactive ageing management. Here we are installing a measuring point to monitor displacements. 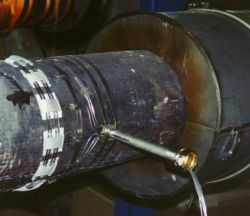 A measurement cube has already been fixed to the pipe. The picture shows the holder for the three displacement sensors being installed. These will monitor each movement of the measurement cube – and therefore the pipe – during operation. 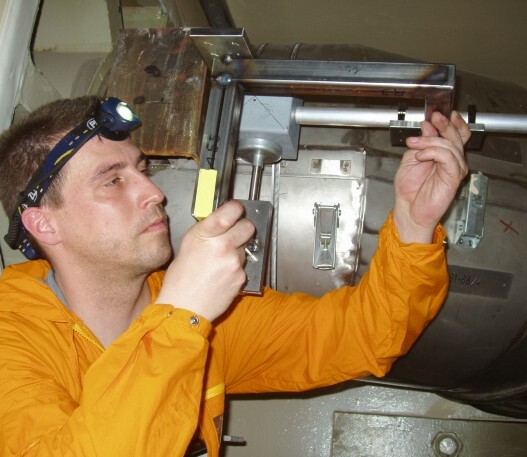 These measurements help to validate calculations and prove that no relevant vibrations occur during operation. The most important causes of unexpected material failure in nuclear power plants are thermal loads. In long-term operation, extremely wide-ranging temperature characteristics can occur – depending on the corresponding modes of operation. Measurements monitoring temperatures can be used to determine the load cycling actually occurring and so define realistic fatigue levels. For example, we measure the temperature stratifications around the pipe diameter from hot (top) to cold (bottom). 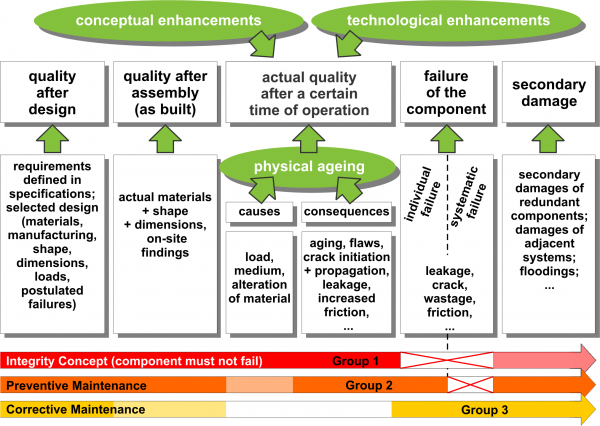 These cannot be defined accurately during the design phase and may result in degradation to a component. Monitoring fatigue enables a more precise understanding of which operational procedures have a particularly marked effect on fatigue. This enables activities for optimising the mode of operation to be developed, so that further progress of the fatigue can be slowed down or even stopped. This enables long-term safe and reliable operation. The safety and reliability of a nuclear power plant depends significantly on the state and the properties of its components. It must be proved that these components fulfil specified requirements. Evidence of quality is required. This is initially controlled and documented during design and manufacture. During operation of a nuclear power plant, specifications and the state of the components may change. It is also possible that the state of quality is influenced by new knowledge and experience, as well as by technical and scientific progress. All these changes are summarised by the term "ageing". The quality after a certain period of operation may differ significantly from the quality directly after manufacture. If there are ageing phenomena during operation that were not taken into account during the design phase, component failure may result, leading in turn to subsequent damage.